Europe’s most complained about airline, Ryanair has started operating scheduled flights from Cardiff to Malta, one of a number of new summer destinations from the Welsh airport. The new service started on April 3rd and will operate twice a times a week and is part of three new routes from Cardiff, the other two being Barcelona and Malaga. Ryanair will be operating five routes from Cardiff this summer. Alejandra Ruiz of Ryanair said, "We’re pleased to officially launch our new twice-weekly service from Cardiff to Malta." 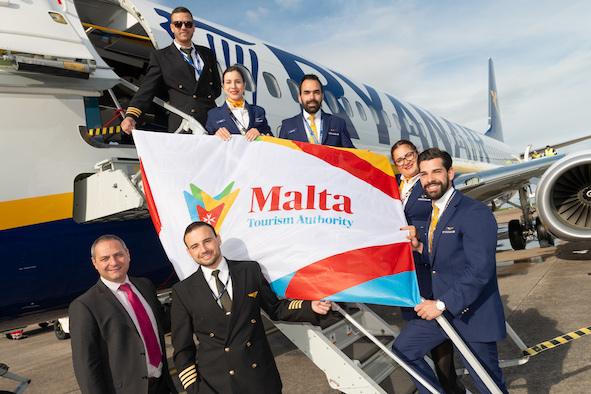 Cardiff Airport’s CEO, Deb Barber, said "After the launch of flights to Barcelona yesterday (2nd April) Ryanair’s exciting start to the summer season at Cardiff Airport continues today with the launch of flights to Malta. The island is a stunning holiday destination in the Mediterranean and a hidden gem, with a pleasant climate, a busy calendar of events and a rich history to explore. What’s more, there is a thriving Maltese community in South Wales, so these flights will serve as an ideal connection between both countries. We look forward to the start of flights to Malaga when they begin in June."